BBC TV presenter Jeremy Clarkson has made another gaffe. At a press conference in Sydney (where he's filming) he suggested that Prime Minister Gordon Brown was a "one-eyed Scottish idiot". You may feel that's a fairly unpleasant thing to say about the PM and he rightly apologised afterwards. So another BBC presenter says something he shouldn't have. Why can't people handle themselves with a bit more dignity instead of behaving like unruly schoolchildren? Perhaps the BBC would be better off with a presenter whose up-and-coming. There a some bloggers that behave like unruly children too! I always wonder how they gate away with and why people rate them so well because of it! It wasn't a gaffe. You say he shouldn't have said it. That's your opinion. He expressed *his* opinion - and why shouldn't' he? His "apology" only related to the "personal appearance" thing, so that leaves "Scottish idiot" on the record. Good for him. The last thing the BBC needs is more "right on" nascent concentration camp guards ready to denounce others for their thought crimes. Jeremy Clarkson is a national treasure and Top Gear has a massive global audience. Perhaps the viewers have a better idea of what constitutes a talented presenter? The headline captures extra readers and isn't necessarily my opinion Tom. Making pejorative remarks against the Prime Minister, is in my view, counter-productive. If he has something to say let's here more about his views on how he would change things. 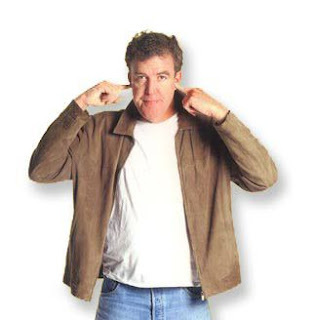 Clarkson certainly has a massive audience but as a presenter, I'd love to see him be more refined. Tom, we probably both remember Peter West, Ray Moore, Raymond Baxter and my namesake David Jacobs. "I don´t get it. Gordie is one-eyed, he is Scots, and he is an idiot. What´s the problem"? Clearly there isn't one David.